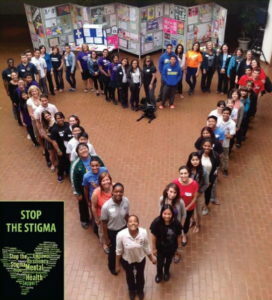 In the spring of 2014, TCDSB was approached by SMH ASSIST and RNAO to enter unchartered waters by developing a partnership to support youth engagement and raise awareness of mental health and addictions. The road was not always an easy one to navigate. Involving boards of education, Public Health Units and the RNAO brought many interests and demands at the table. We needed to learn each other’s “language” so we could create something meaningful and beneficial for youth. Despite some speed bumps, such as the necessary step of satisfying legal departments, the work of the youth involved was top rate. Essentially, youth co-created a framework for other schools/school boards to use when developing local mental health awareness and anti-stigma initiatives. The framework included preparation, recruitment, learning parameters and activities – a reflection of the youth involved. 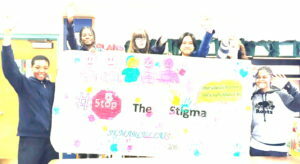 At TCDSB, we had already developed a local “Stop the Stigma“ initiative with a strong presence in our secondary schools. 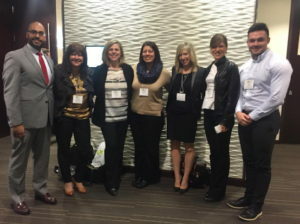 The Youth Mental Health and Addictions Champions project allowed our board to grow our success into the elementary panel. We included two elementary schools in the pilot program. The following year (2015-16) we grew and added nine schools. We will expand to nine more schools in 2016-17! This would not have been possible without the partnership with RNAO and Public Health. Through this partnership, our board became engaged with valuable partners. This partnership helped propel student engagement for mental health further than we could have imagined. I learned that when opportunity knocks, it is always a good idea to respond!